VA medical centers are places where many veterans receive their health care, engage with other veterans in support groups, therapy sessions, and socialize. The VAs are also epicenters of veterans in crisis. As an attorney working in a medical-legal partnership at VA hospitals in New York City, I have seen firsthand how veterans, in particular those who are chronically ill, can be overwhelmed by multiple, interconnected crises. One of my clients, an Iraq War veteran who has severe post-traumatic stress and a brain injury from a roadside bomb, has been unable to work since he left the military a year ago. The veteran's wife is now his full-time caretaker, but his VA compensation claim took nearly a year to process, so the couple cannot afford an apartment of their own. They joke that they are on the "couch tour," bouncing between family and friends' houses, but the veteran's memory problems, panic attacks, and homelessness strain their marriage. Another client sought legal advice after meeting with her support group for survivors of military sexual trauma. She is fighting to keep her children in her life even as she struggles to maintain stable housing, secure VA benefits for a disability caused by her service, and battle an alcohol addiction that has led to a criminal conviction. She considers violating parole to visit her children. I wish these stories were unique, but they are not. Many veterans that I represent are living on the street, victims of domestic violence, overwhelmed with debt that accumulates while they wait for benefits to be processed, and involved in the criminal justice system. In order to attack layers of problems like these, advocates must address many civil legal needs, including housing, employment and family matters, and representation in VA benefits cases. This requires more than just the commitment and passion of dedicated civil legal services attorneys. We need to recognize the limitations of our economic and human resources, and find creative ways to empower veterans facing social challenges and in the process multiply the impact we can have. In the last several months, I have had the good fortune to be involved in developing initiatives that are doing just that. 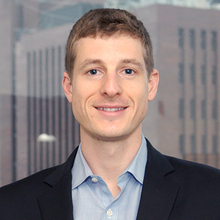 Working with the New York Legal Assistance Group's LegalHealth division, which partners with medical professionals to address the legal needs of low-income individuals with serious health problems, and Latham & Watkins LLP, my Equal Justice Works fellowship sponsor, I have created two new educational and outreach initiatives targeting veterans. The first is a series of "Legal Stand Downs," events where veterans can learn about their legal rights and have the opportunity to ask legal experts questions about their individual situations. The series, which is modeled after the stand down concept used during the Vietnam War to provide a safe retreat for units returning from combat, has thus far provided information to over 200 veterans in the areas of family and housing law. In the months ahead we will conduct additional Legal Stand Downs covering VA benefits, consumer debt and bankruptcy. 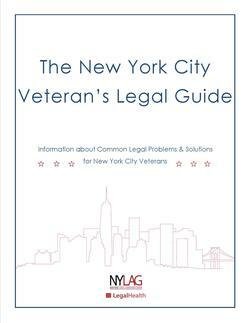 The second effort is The New York City Veteran's Legal Guide, published with generous support from Latham & Watkins and input from more than 20 NYLAG and Latham attorneys and paralegals. The guide contains information on 50 of the most common legal issues facing veterans, including: how to deal with housing problems like evictions and requesting repairs; information about various VA benefits; the basics of the Family and Medical Leave Act; and how to get an order of protection -- always with clear direction on when to consult an attorney. More than 300 guides have been distributed to veterans, VA hospital staff, social workers and veterans' organizations across New York City. A second edition of the guide will be printed in 2016. These new programs empower veterans by demystifying complex government and social programs, and helping them know their rights. They also provide a basic understanding of the law that can help people to catch legal problems before they reach crisis-level, or prevent legal problems from arising in the first place. They teach veterans about when to seek legal counsel, so that when they face enormous legal challenges, they do not have to fight alone.